It’s a combination that I will always love. It’s the simplicity of peanuts and red hots that reminds me of my childhood days, and in particular fond memories of my grandpa. My grandpa was a hardworking guy, and as I was growing up I knew him to be kind with a smile, a man who loved to smoke and play solitaire, and then enjoy and relax his weekends drinking beer and hanging out with us. He was the front gate man at Indiana Beach, for what seemed like an eternity, and I’m certain those who frequented Indiana Beach probably knew Gary. There are many great things that I loved about my grandpa, but one of them was watching baseball and sharing one of his favorite beer snacks. 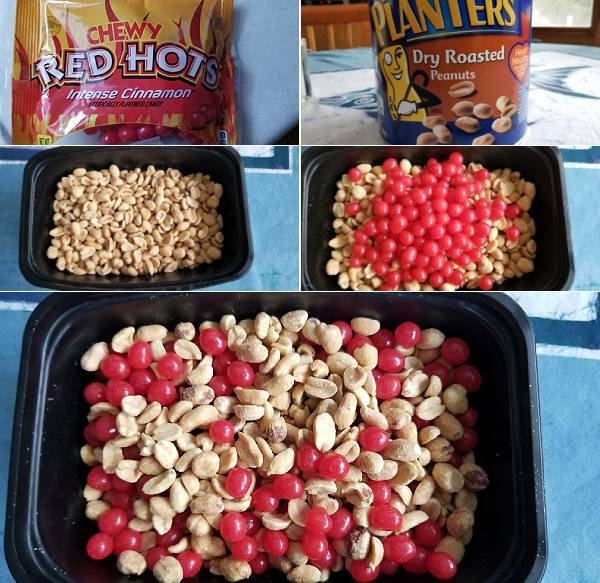 Peanuts and red hots. In my many years since his passing, I have never met anyone, nor seen anyone serve peanuts and red hots. Whether it just be hanging out at someone’s house, at a bar, or at any party, the peanuts and red hots were an unknown. Granted, I do not see many people buying bags of red hots or what they call cinnamon imperials nowadays, I decided to bring these back out for my family to enjoy. These are still one of my favorite snacks, and a handful really does the trick. The salty, a bit sweet, with that subtle bite from the cinnamon makes it a really awesome snack. That’s it. Adjust your ratios accordingly and since I bought in bulk, I made roughly 4 cups of peanuts, 2 cups of red hots. You get it. Place both in a bowl, and give a good mix. Pour into a bowl and get your snack on. Trust me… Even if you are skeptical of the red hots, I think the combination will do the trick. There’s something addicting. Maybe it is the chewy texture along with that subtle creaminess of the peanuts… not sure. Did you grow up with something like this as a snack, and one that brings back great memories of your grandparents? Enjoy! My family did this too!